Should Your Car Wear a Fish? Of all the burning doctrinal and theological issues facing Christians in 2018, one of the most perplexing is: To fish or not to fish? That is the question. By this plastic symbol on the back of your donkey shall all men know you are my disciples. 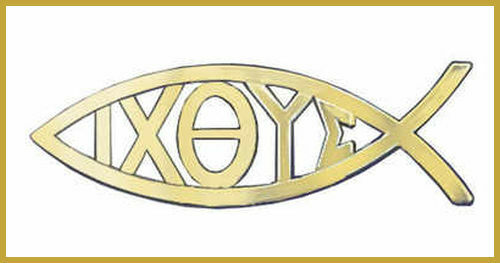 The fish symbol has been the object of parody over the past several decades, but if nothing else, this shows the widespread acceptance of the auto-emblem version of the icon, at least in North America. The symbols are available plain or with the Greek letters, but if you choose the latter, you need to make sure it’s pointing the right way. But the right way will vary depending on how they designed it. In terms of the blank ones, sadly many a church has split over the correct direction of the piscine creature. There are many videos online (including some from the many detractors who insist it’s a Satanic symbol) concerning the Ickthus and its many parody versions, but for a simple, straightforward understanding, watch this Anglican priest’s 2-minute explanation. Oh…and as to our opening question, if your car or truck or SUV should wear a fish, I think a lot of that answer depends on how you drive. ‘Nuff said. Lapel Pins: Seems silly to begin the list with what was generally a $2 – $3 item, but Christian bookstores sold a ton of the little pins. Evangelicals were the biggest customers who preferred pins that were witness items. But then everything went Casual Sunday. No suits for men = no lapels. Relaxed dress for women = no jewelry. Bible Software: With so much available online, we don’t hear much about new software anymore. Furthermore, retailers got tired of being stuck with software that became obsolete with newer operating systems, or newer versions of the software itself. Concordances: While it could be argued that the proliferation of online resources limits the need for all Bible reference products, once you’ve used Bible websites, using a print concordance is a real pain. Choral Music: What’s a choir? Praise & Worship Songbooks: Surprise! You thought we were going to say hymnbooks. But in some stores hymnbooks actually sell better than worship folios and chorus books. The reason? Modern worship leaders get everything they need from CCLI (Christian Copyright Licensing Inc.) and in the trenches, the congregation doesn’t use print music at all, as everything is projected on a screen. So yes, Hymnbooks and the things which replaced them are vanishing. Tracks: In many churches, a soloist can simply get the worship band to get charts for her/his song, and audiences prefer live music over canned music. But in many churches the “special” has gone the way of the dinosaur. Tracts: The printing and distribution of gospel tracts was a cultural phenomenon that was an extension of a wider movement in which political broadsides were as common as religious ones on Main Street. Furthermore, current trends are moving away from conversion by argument. However, the cream always rises to the top, so tracts like Steps to Peace with God still sell well. Bookmarks: If fewer books are selling, then that means fewer bookmarks, right? Well, not so fast. Sometimes the bookmark (minus the book) simply becomes the gift in the hope that the recipient is currently reading something that needs one. Children’s Colouring Books: Older elementary kids can do amazing things on their Mac or PC, so you’re not going to impress them with a coloring book and a package of four crayons. Of course, as we learned in the last five years, for adults, it was a whole other store. Sunday Bulletins: Churches large and small can create amazing color graphics on the church computer, and megachurches send all their weekend bulletin needs to a local print shop. Ditto brides planning their weddings or families constructing a print memorial to be given out at a funeral. So while Broadman, Warner, Cathedral Art and others can claim healthy sales, the handwriting is on the wall, or more accurately, on the laser printer. In Canada, funeral bulletins are about the safest inventory bet. Sunday School Record Books: Attendance records still exist as parents use a swipe card to check their kids in and out of the Children’s Ministry Centre, but there’s no need for wall charts and stickers. Besides, what organized sports couldn’t do to disrupt church attendance, the demands of parents’ shift-work jobs did. Many kids can only make it every other week, so publicizing attendance almost shames the child who can’t make it each Sunday. Christian Magazines: In days of yore, when the pastor came to visit, you demonstrated your spirituality by having Christian Life and Moody Monthly prominently displayed on the coffee table. Nothing needed to fill the gap here because increasingly, the pastor doesn’t come to visit. Clip Art Books: In the days before copy-and-paste there was cut-and-paste, and any church secretary worth their salt knew how to integrate these in the weekly bulletin and inserts. Someday archeologists will find one of these and not know what its purpose. Christian Breath Mints: It’s not that people don’t still need breath fresheners, it’s simply that Testamints became such an object of ridicule. Apologies to the company if they still manufacture. ♦ The upside? Christian bookstores can better focus their energies on books and Bibles. Strengthen the things that remain. So what did we leave off the list?